Prior to Design Space 3 the cutting order of the layers was controlled by the colours Hex code in order of lowest to highest. For example the Hex code for white is #FFFFFF and the Hex code for black is #000000. Black would always cut first (as it's the lowest number) and white would cut last, with all the other colours being sorted by Hex code value in between those two colours. In Design Space 3 that has now changed and the layers are sorted by HSV - that's Hue, Saturation and Value. 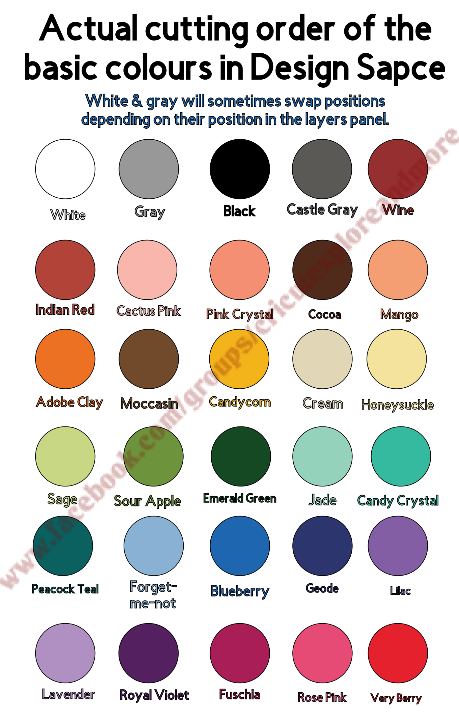 Here are the Basic colours in the DS palette in the order they appear in the layers panel. 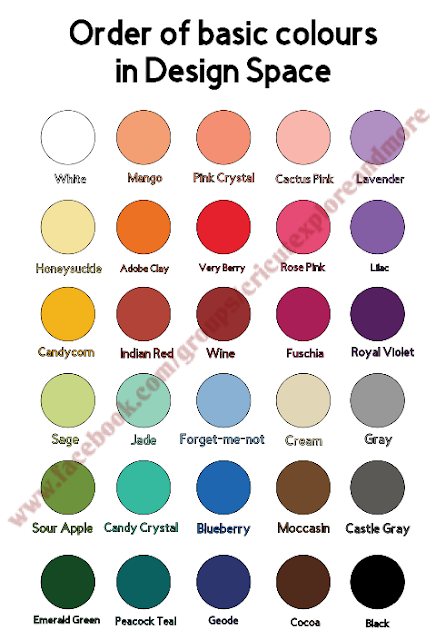 And here is the order that the Basic palette colours are sorted when you go to cut. So what does this mean to you? Nothing really, unless you want to force Design Space to cut your layers in a particular order. Just use the second image above as a guide as to the colour you should make your layers. For example, say you have 3 shades of pink in your design and you want to cut them from lightest to darkest. You could change the colours in your design to Cactus Pink, Pink Crystal and Rose Pink and that's the order they would be cut. Remember that this is only the Basic colour palette. If you use a colour that's not in the Basic palette it will be sorted according to its HSV value. That's when it gets messy. There are HEX to HSV converters available. Here's a link to the one I found the easiest to use. I think it's easiest to just stick to the basic colours. However most of the images you use (Cricut and imported) will use colours other than the basic colours. At least now you'll know how they've been sorted when you click "Make it"! Here's the info on HSV sorting from that website. CRICUT: What is the Cricut Circle? 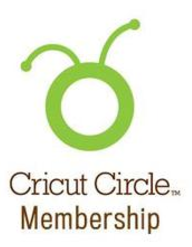 Quite a few years ago Cricut created a club called the Cricut Circle. It had it's own private message board and special events that were only available to Circle members. There was also a free Cricut Circle exclusive cartridge every quarter, 10% off purchases and free shipping. The cost to join (from memory) was around $300 per year. Over the years the Cricut Circle has been scaled down quite a bit. When joining you now get just the one cartridge per year (you select the cartridge each year when you purchase your Circle membership) and you receive 10% off your purchases from Cricut.com and receive free US/CAN shipping. The cost to join now is $79.99. It doesn't auto renew so you need to purchase your membership each year and select your cartridge. The 10% discount is stacked on top of the 10% discount you receive if you have a Cricut Access Subscription. And again on top of my NARELLE 10% discount that you can use during checkout. The NARELLE code doesn't work on Cricut Explore/Maker machines, Cricut Access subscriptions, the Cricut BrightPad or the Cricut EasyPress. But the Cricut Circle and Cricut Access discounts do work. So if you do a lot of shopping at the Cricut store and there's a cartridge in the available list that you like (there's 20 to choose from) then the Circle membership could be totally worth it especially if you also have Cricut Access. When all available discounts are stacked together you can get up to 30% off your purchases. And that's on top of any sale prices! 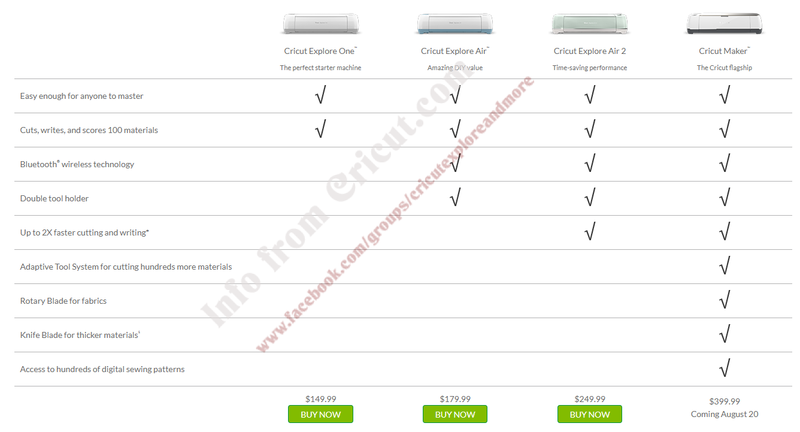 CRICUT: EasyPress is available now! Don't know what the EasyPress is? Here's the info from Cricut. Get professional iron-on results in 60 seconds or less. An evenly heated plate and simple controls make EasyPress™ the foolproof way to get flawless transfers that really last. The Cricut Easy Press Silicone Mat isn't available for purchase yet. For those of you who live in Australia, the EasyPress is NOT dual voltage. So using a travel adapter won't work. But Cricut are working on an EasyPress for our power grid. There's no date for that launch but they're in full swing getting it ready! 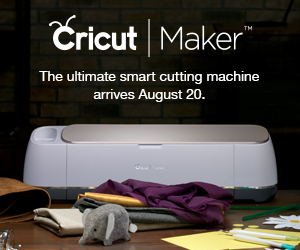 CRICUT: The Maker has been launched! 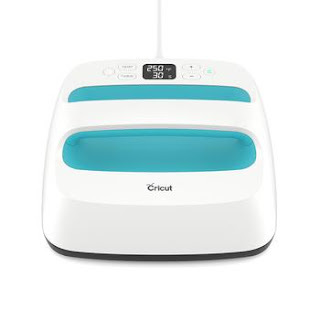 The Cricut Maker has launched at the Cricut store! The cost of the Cricut Maker is $399.99. If you're a Cricut Access Standard or Premium subscriber you'll save 10% off that price. And if you're a Cricut Circle member you'll get an additional 10% off. Here's an article I recently wrote about Welding in Design Space. Hope you find it helpful. These two samples of text are unwelded. There is space between all the letters and that’s how they will cut out. Script text usually looks best when it’s welded. Non script text generally looks better unwelded. But welding isn’t just for fonts. You can weld images together too. Say I want to use this image to create a title across a scrapbook page. ... then making sure they are touching, select them all and Weld. Now they’ll cut as one object instead of 5 separate objects. Another example would be if you want to make a shaped card. Start by adding that shape to your Design Space canvas. Using the Edit bar, change the size to the height and/or width you want your finished card to be. With the image selected go to the Layers panel and select Ungroup. Click on the bottom frog layer then select Duplicate. A copy of the bottom layer will appear. Click on the “eye” next to the three middle layers to hide them. Now only the two solid layers will be showing. Decide whether you want a vertical folding card or a horizontal folding card. For this tutorial I’ll be making it a top folding card. From the Edit toolbar click the Flip button then select Flip Vertical. The image will be flipped upside down. To ensure that the two images are symmetrical we also need to flip the top image horizontally. With the image still selected click the Mirror Horizontal button. Now drag the top frog up and position it so the two heads are touching. It’s up to you how much you want these two pieces to overlap. Select both frogs then click on the Align menu from the toolbar and select Align Left. Now, with both frogs still selected, click the Weld button at the bottom of the Layers Panel. You can see that the two images have been combined into one. If you feel that the join isn’t going to be strong enough when the card is folded, select Undo (to reverse the weld process), move the two images slightly closer together then Weld again. Go back to the Layers panel and click on the closed eyes to show those hidden layers. Those layers will be positioned beneath the welded layer. You can now move the top layers into position on top of the welded layer to see your finished card. Here it is as a horizontal card. You can also weld text onto and inside images. Welding cannot be undone once you have closed your Design Space file. You can use the Undo button to reverse the welding process even after saving your project. But if you weld, save and close that project you will not be able to go back and unweld. It’s always a good idea to duplicate any images/text before you weld. 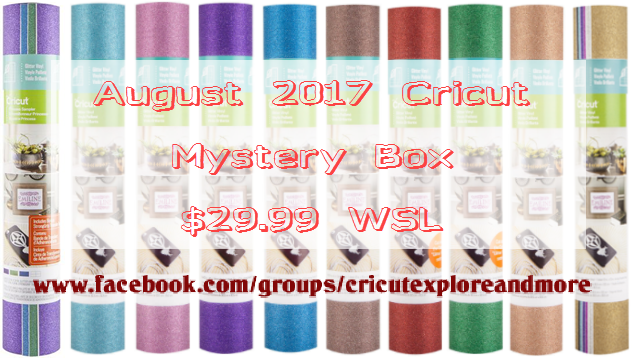 The August Mystery Box from Cricut is here! This months mystery box is all about the glitter! Here's what you'll find in the box. As usual, stocks are limited.